The recently released third edition (2010-2011) of The 500 Most Influential Muslims, has bestowed a deserved distinction on Professor Salim T S Al-Hassani, the President of the Foundation for Science, Technology and Civilisation (FSTC). The publication is an initiative of the The Royal Islamic Strategic Studies Centre (MABDA), which itself is an independent research entity affiliated with the Royal Aal al-Bayt Institute for Islamic Thought, headquartered in Amman, Jordan. Professor Salim T S Al-Hassani was selected as one of the Muslims who, by their work, represent a worldwide influence on the Muslim community, this influence being the power (be it cultural, ideological, financial, political or otherwise) to make a change that will have a significant positive impact on the Muslim World. 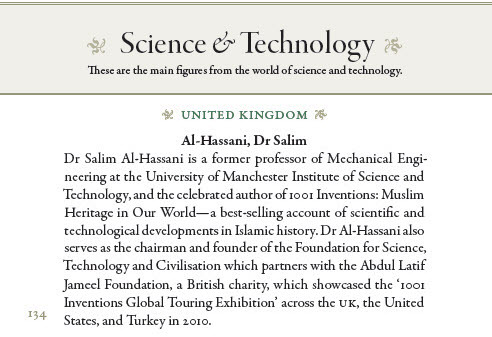 The recently released third edition (2010-2011) of The 500 Most Influential Muslims, has bestowed a deserved distinction on Professor Salim T S Al-Hassani, the President of the Foundation for Science, Technology and Civilisation (FSTC). The publication is an initiative of the The Royal Islamic Strategic Studies Centre (MABDA), which itself is an independent research entity affiliated with the Royal Aal al-Bayt Institute for Islamic Thought, headquartered in Amman, Jordan. 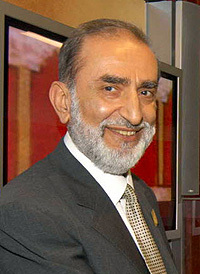 Professor Salim T S Al-Hassani was selected as one of the Muslims who, by their work, represent a worldwide influence on the Muslim community, this influence being the power (be it cultural, ideological, financial, political or otherwise) to make a change that will have a significant positive impact on the Muslim World. Professor Salim Al-Hassani's message is short and simple: "To build a better future, we must learn from our past." Achieving this is not as easy as it seems because history, as we know, is not a simple flow of events through time. There is a lot of information that has been lost, hidden, corrupted and biased. It is in this critical area of revisiting the history of what the Western education systems refer to as the Dark Ages, which Muslim history calls The Golden Age, that Professor Al-Hassani has devoted so much time and energy during the past two decades. Prof. Al-Hassani founded FSTC with his colleagues around a new concept of charity and volunteer action aimed towards creating a solid ground for inter-community and inter-cultural understanding and cooperation, far away from political and religious boundaries. By choosing also to articulate the work of the foundation around science and technology, rather than the classical initiatives of inter-religious and cultural dialogues, he proved to be sensitive to the call of the modern world. Science and technology represent our best tools to build a better future for the coming generations. But the history that they receive should not suffer from oblivions or gaps, nor be the locus where complexes are born. A complex of superiority on one hand, from the triumphant Western Civilisation, nor a complex of inferiority within the modern heirs of Muslim Civilisation. These complexes do not promote dialogue or self-esteem, but antagonism and extremism. Turning his attention to the past, he kept his eyes on the present. The central slogan of his work "Muslim Heritage in Our World" depicts this twofold and informed gaze. The present is built on the past, and in order to be able to learn from the latter, we must re-discover it and make clear the ties it has with the present. From this perspective we can all work together in the present to build a better future for all our heirs. Projects like "FSTC", "1001 Inventions", "MuslimHeritage.com" and "CE4CE" represent this central tendency which guided the work of Salim Al-Hassani in promoting Muslim Heritage and its ramifications in our present day world. Phrases like "Cultural Cohesion", "Social Understanding", "Respect for Diversity", "Working Together", "Building Bridges", "Creating Awareness" and many more promoting inclusion found their real meaning through these projects. In 1999, Professor Salim Al-Hassani and other colleagues founded the Foundation for Science, Technology and Civilisation (FSTC). Professor Al-Hassani was, until the end of 2011, the Chairman of the Foundation. He is now the President of FSTC, Professor Mohammed El-Gomati is now Chairman. FSTC is a not-for-profit educational foundation which aims to generate social cohesion, inter-cultural appreciation, and to promote science and learning as an alternative to negative and extremist behaviour. It does this by illuminating the shared scientific heritage of humanity, with its initial efforts centring on uncovering the very significant scientific contributions by the Muslim Civilisation. In its various projects, from books to lectures, seminars, exhibitions, films and electronic publications, FSTC is supported by a large network of historians of science, academics, writers and intellectuals. The projects carried on by FSTC are a compilation of stories that tell the history of science, technology and culture dating back to a thousand years, which are absent from school books, particularly in the West. This thousand-year time frame corresponds to a period after the fall of the Roman Empire to the beginning of the Renaissance in Europe, the period commonly known as the ‘Dark Ages.' This is a misnomer, as this period was not really dark, and outside of Europe people were living in a golden age, in the sense that the age of discovery and science had never really ceased. This period also corresponds to a time when the Muslim civilization was flourishing. Yet, when we look at European sources on mathematics, astronomy, chemistry, physics, technology and medicine, we find a one thousand year gap. Does this mean that the readers who derive their knowledge from these sources suffer from a thousand years amnesia? This amnesia is of a dangerous type, in that it both feeds the superiority complex, and introduces an inferiority complex among other nations, particularly within young Muslims. This gap in our history is destructive, rather than productive. Moreover, it will not help create or maintain peace in the world. Therefore, FSTC uses history of science as a new platform for dialogue. The Foundation is non-religious and non-political. Its researchers have chosen from among thousands of inventions to bring life to some of those that still are present in modern society. The research to document, verify and produce the content supporting the work of FSTC is carried out by a large number of academics and experts in this field to ensure that the information placed in the public domain meet high academic standards. The aim pursued by FSTC in its main projects and global mission is to create a new platform, capable of using the roots and routes of scientific inventions to enhance social cohesion and to induce cultural inter-appreciation. 1001 Inventions, which has become a global success story attracting one million to its travelling exhibition which has toured London, Istanbul, New York and Los Angeles. The Library of Secrets film starring Sir Ben Kingsley, produced for "1001 Inventions" touring exhibition, has received 21 international awards and has been downloaded 12 million times. MuslimHeritage.com was launched in 2002 as the central academic web portal of FSTC; at present, it includes hundreds of peer reviewed articles, published online and consulted for free by thousand of visitors on a daily basis, from all over the world. Curriculum Enrichment for the Common Era (CE4CE) was established in 2009 to further develop work with education in schools, prisons and communities around the world and receives 200 monthly users of its online teaching materials. The Muslim Heritage Awareness Group (MHAG) is expanding globally with networks in the UK, Turkey and the USA. The Arabick Roots exhibition opened in June and sponsored by FSTC at the Royal Society proved to be yet another great success story.